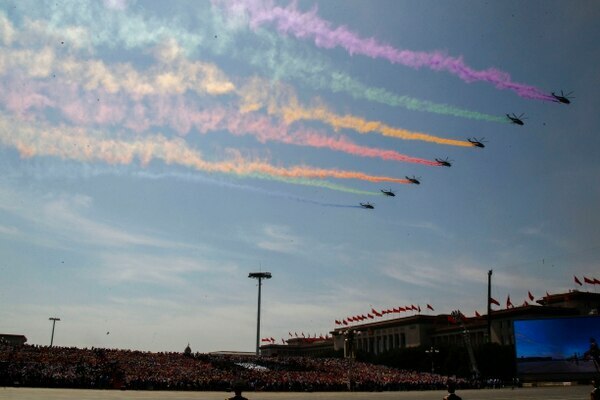 BEIJING — With fighter jets roaring overhead, China's leader presided Thursday over a massive parade of tanks, missiles and troops that displayed growing military might, but also pledged to reduce the army by 300,000 troops in a bid to show that his country poses no expansionist threat. Xi kicked off the proceedings with a speech from atop iconic Tiananmen Gate, flanked by Chinese leaders past and present along with foreign dignitaries including Russian President Vladimir Putin, South Korean President Park Geun-hye and U.N. Secretary-General Ban Ki-moon. To underline that point, Xi said the 2.3 million-member People's Liberation Army would cut 300,000 troops. However, it will still remain the world's largest standing military, and the reduction comes at a time when growing technological capabilities reduce the need for large numbers of troops. 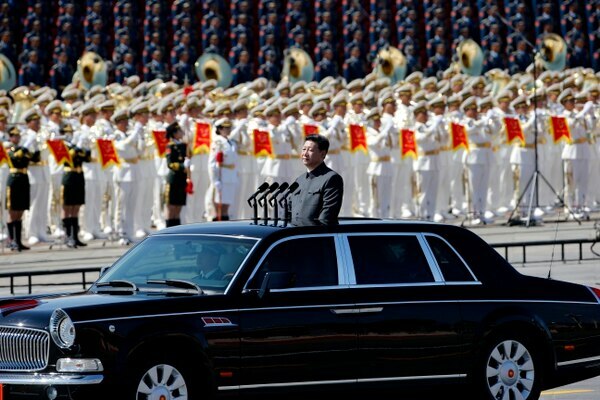 Wearing a gray, high-buttoned suit of the sort worn by past Chinese leaders, Xi then drove past the assembled troops in a Chinese-made Red Flag limousine. Standing in the sunroof with four microphones mounted in front of him, he called out "Greetings, comrades" every few moments before the troops started their marching. Chinese President Xi Jinping stands in a car to review the army during a parade held in front of Tiananmen Gate in Beijing on Thursday. The spectacle involved more than 12,000 troops. 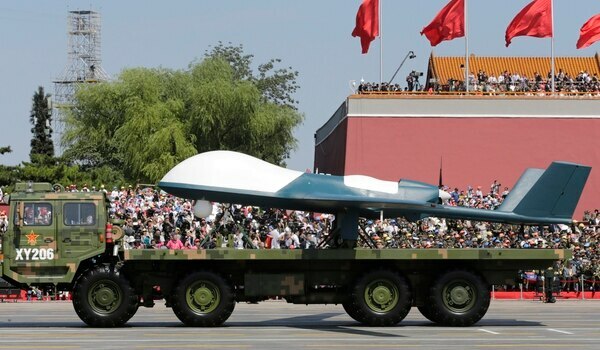 A military vehicle carries a Pterodactyl I unmanned aerial vehicle past the Tiananmen Gate during a military parade in Beijing on Thursday. 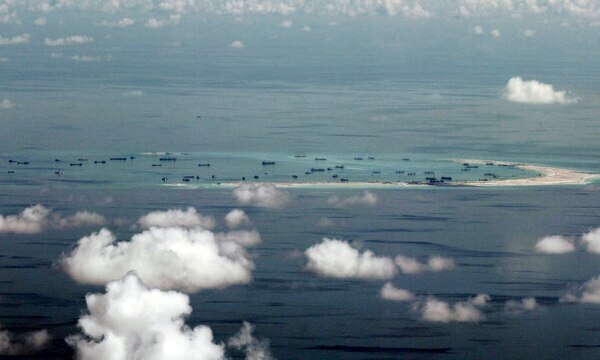 This areal photo taken through a glass window of a military plane shows China's alleged on-going reclamation of Mischief Reef in the Spratly Islands in the South China Sea on May 11, 2015. 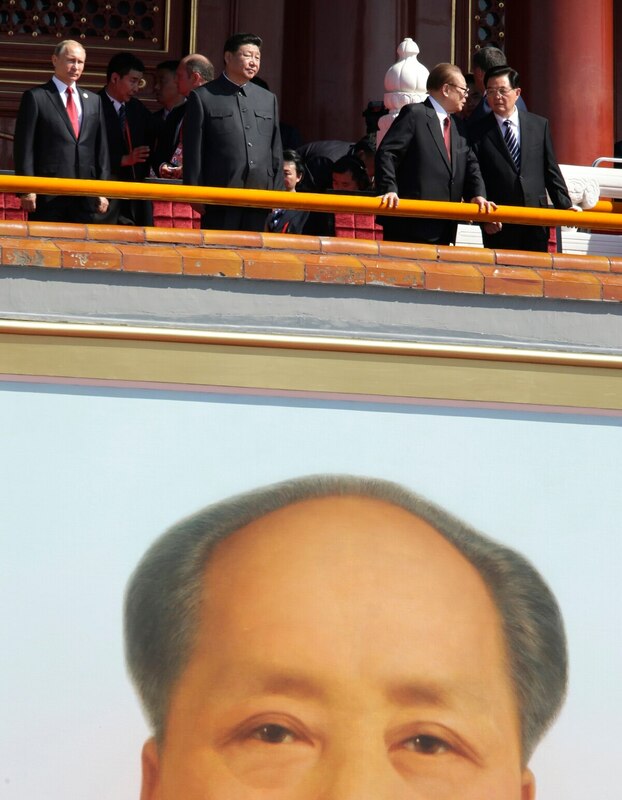 "In domestic terms, it's certainly a plus for Xi. But in foreign policy terms, it's controversial," Joseph Cheng, a retired academic and political analyst in Hong Kong, said. "It doesn't enhance China's soft power. It doesn't help China's image as a force for peace, stability and development." 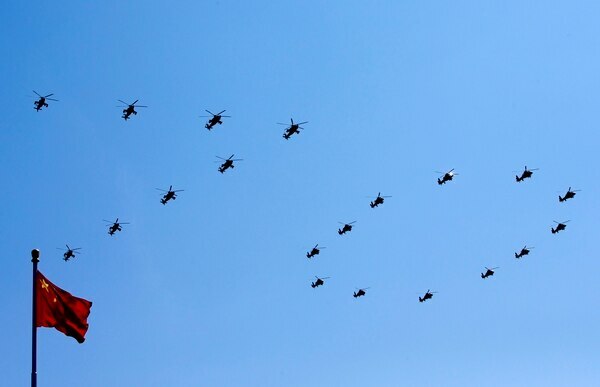 Chinese army attack helicopters form a number "70" flying past a national flag during a parade in Beijing on Thursday. Resistance to Japan remains a core component of the Chinese ruling party's foundational myth and is used as a key source of legitimacy in the absence of a popular mandate derived from free elections. "Rather than focusing excessively on the unfortunate history of the past, we hope that China will address the common challenges facing the international community in a future-oriented manner," Suga said. Military aircraft fly in formation during a military parade to commemorate the 70th anniversary of the end of World War II in Beijing on Thursday. "Military parades are fine, but we're losing business," said a clerk at a convenience store located east of Tiananmen Square that had been forced to close Wednesday afternoon. "It was really exciting," street vendor Huang Mei said. "But I don't think it was any big deal. It didn't really have much to do with us regular people."